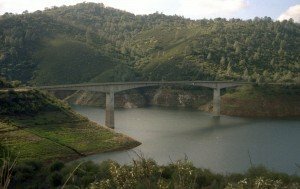 Built in 1979, the Parrots Ferry Bridge spans the northern end of New Melones Lake on the Stanislaus River. Standing approximately 355 high and spanning 640 feet across, the bridge is one of the tallest of its kind in the country (actually tying with California’s Auburn Foresthill Bridge as THE tallest). Plunked down between Vallecito and Columbia about eight miles south of Murphys, Parrots Ferry Bridge is certainly a beautiful site — the green Sierra Foothills bubbling up on either side of the massive stretch of artfully erected concrete, the gorgeous confluence of New Melones and the Stanislaus. It actually makes for a fantastic turn-around point for you cyclists (check out the Parrots Ferry bike route detailed on Biking page). But what’s with the name? In 1860 when the Gold Rush was in full boom, Thomas H. Parrot established a ferry crossing to connect the mining towns of Tuttletown and Vallecito. The ferry was in operation until 1903 and, in 1949, the California Centennial Commission erected an historic marker as part of the Mark Twain Bret Harte Trail series. The bridge is part of Parrots Ferry Road/Country Road E18 and the marker is located at the bridge’s western edge.